Greenbox Architecture created the office design for boutique investment firm, Principal Global Investors, located in Sydney, Australia. After many years at 50 Bridge Street, PGIA sought to make a move to Chifley Square. Greenbox Architecture were delighted to work with Jones Lang LaSalle (JLL) as project managers and Ultra Building Works (UBW) as builders to create a space for such a well-established, boutique investment firm. 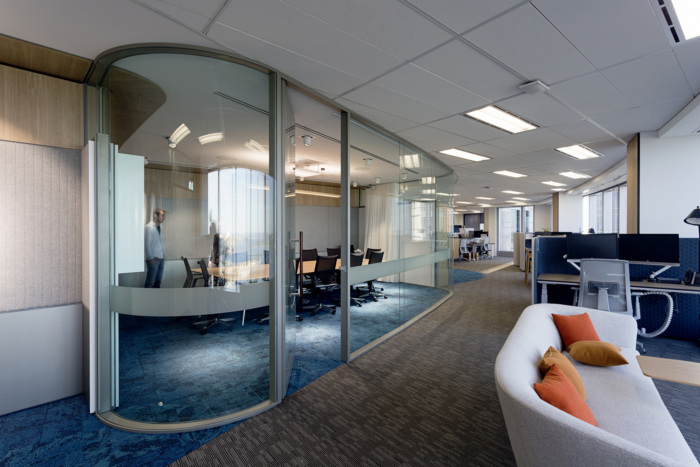 PGIA and the project team took this opportunity to create a space efficient floorplate, address how they maximise their space and build an environment that suits the various working styles of their employees. The goal was to enable collaboration, increase flexibility in working styles and create a dynamic office culture. 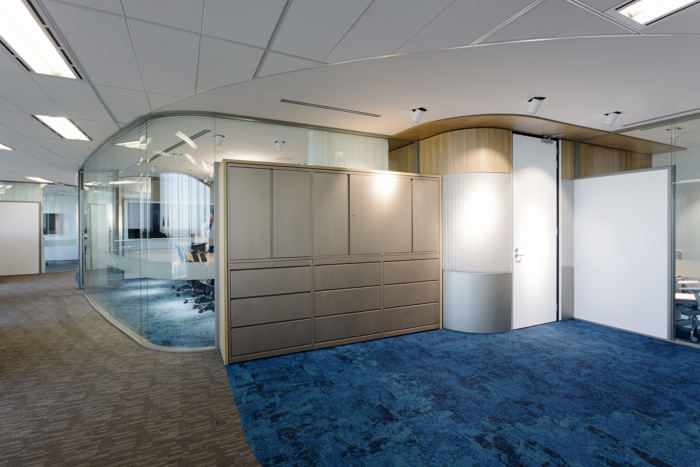 Curved glass meeting rooms were created to mimic and mirror the natural curve of the building and tenancy and contribute to a sense of openness and wealth of space. The option of white curtaining in meeting rooms softens the space and provides the option of privacy. Agile working pods provide a touch down area for concentrated work and an option for an alternate working environment. These cubicles overlook floor to ceiling perimeter glass windows, which feature across all external walls to allow maximum exterior light to flow into the area and vistas to the Botanical Gardens and Sydney Harbour below. An innovative feature acting as a backdrop, entails the combination of timber and fabric paneling extending floor to ceiling and continuing further onto the ceiling, provides a sense of continual flow from front of house to back of house. The primary views of the harbor afforded to the break out area for the enjoyment of staff, further encourage additional workplace interactions. The kitchen and break out area highlight contemporary white and timber furniture, while timber handle accents on kitchen joinery tie together the overall look of clean, elegant, sophistication. The colour scheme has been carefully considered juxtaposing muted beige and white elements against deep turquoise feature carpets and a backdrop in the kitchen. Comfortable, adjustable office furniture in meeting rooms and height adjustable, sit-to-stand desks throughout accounts for an ergonomic office experience, supplied by Haworth. The result is a sophisticated flexible and collaborative environment allowing innovation through planning and design.